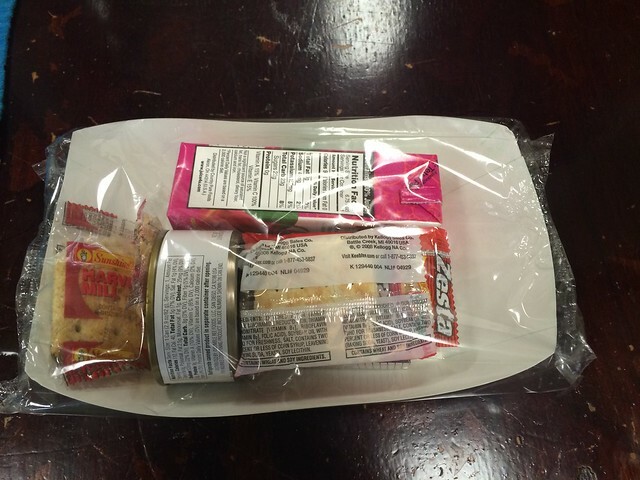 Every child in the School District of Philadelphia receives free breakfast and lunch, much of it pre-plated- a service contracted out to the Maramont Corporation. 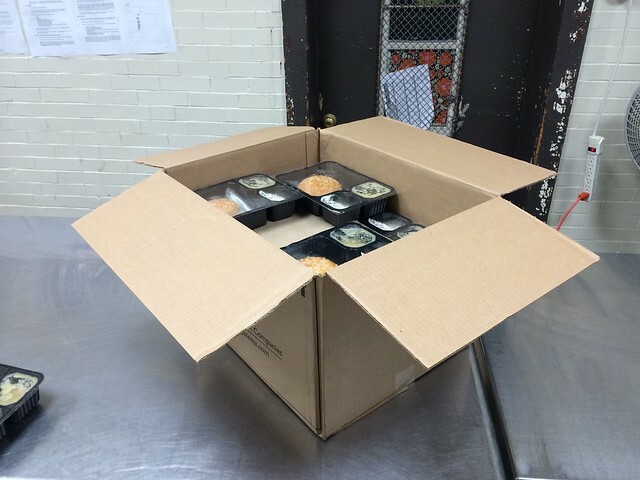 The food arrives at the school via truck, frozen and prepackaged in an individual serving. 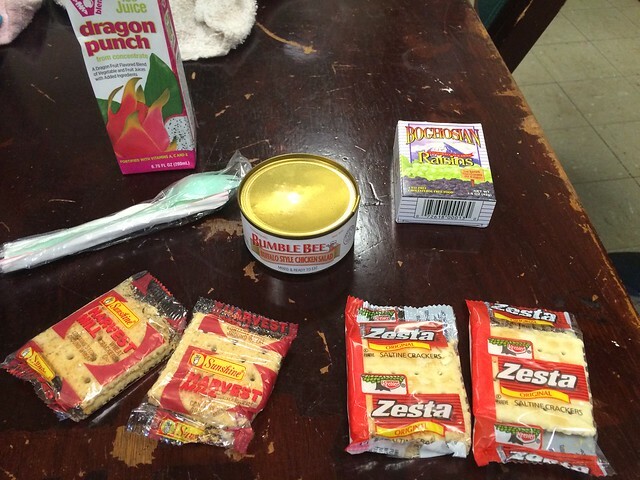 The canned chicken, crackers, raisins, and juice combination was served for breakfast at summer camp. This poster hangs above the cafeteria service window at Sayre High School. 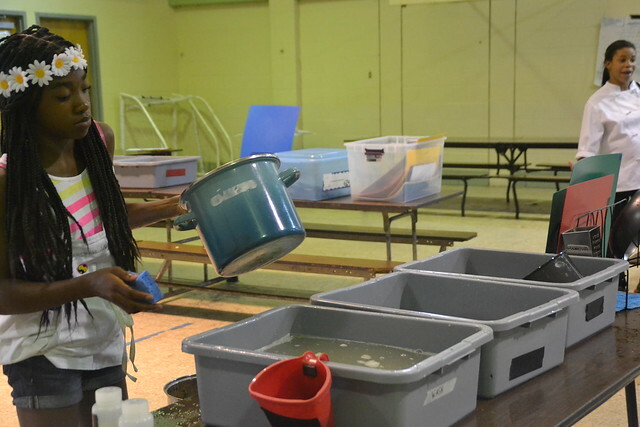 Due mainly to budget and infrastructure realities in Philly Schools, it is difficult to see the Philly school food service situation drastically improving in the short term. Few would argue that in its current state, there are far too few fresh, seasonal, and palatable food options for breakfast and lunch and that there is far too much uneaten and wasted food across meals as a whole. Anecdotally, more than half the food served is thrown directly into the trash can- with a disturbingly high percentage of vegetable dishes. Kids call the meals ‘space food’ and ‘prison food’, and the truly hungry who do eat the food are ridiculed and teased by their classmates for being ‘poor’. Food waste in schools isn’t an immediate priority because it has little financial impact- the school district is reimbursed by the federal government for every meal served, not every meal consumed. Put plainly, the food served and the setting it’s served in represents the worst our food system and our education system have to offer. 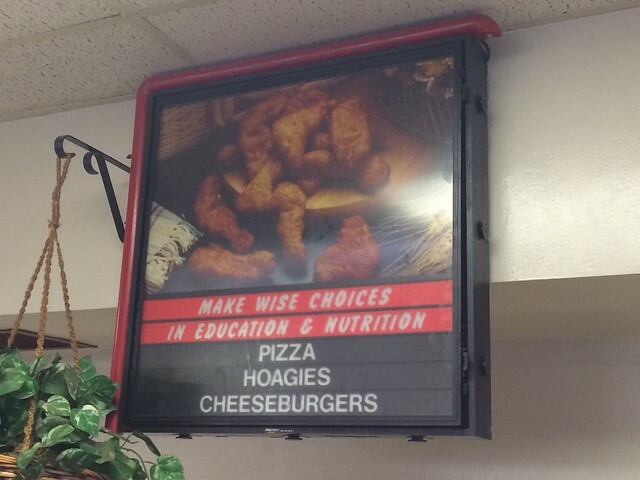 It reflects the value our society places on poor children, and it is a poor reflection indeed. 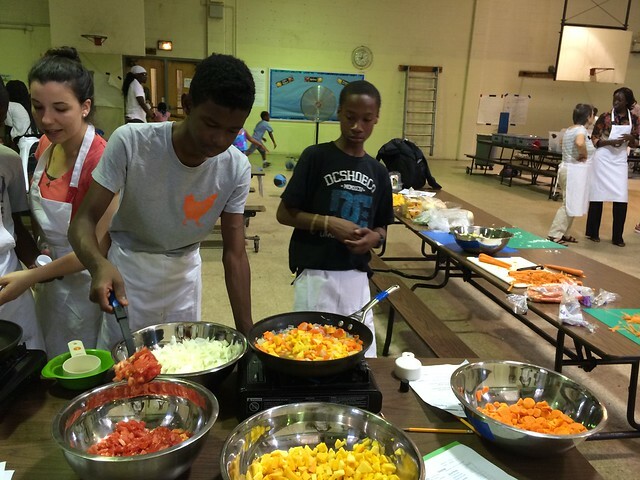 For this reason, the Cooking Crew project was developed with the purpose of creating a radical transformation to the food landscape in Philly schools. 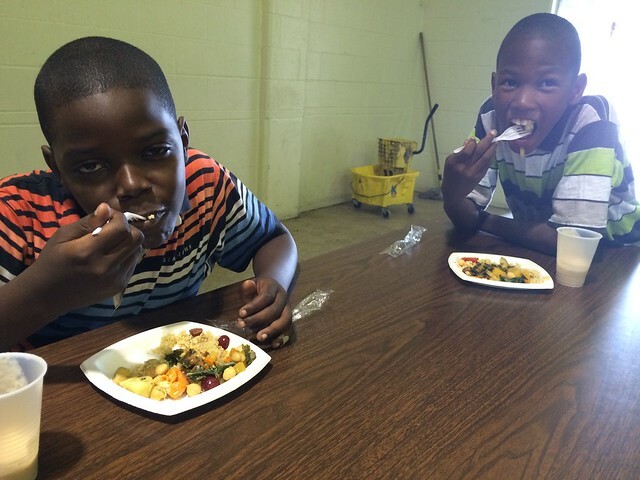 present the dish to their peers, serve the dish, and clean up after themselves. Each of these activities is worth a certain number of points, awarded to the team. Outside of the two hours, students work in art class decorating aprons and designing centerpieces for serving tables, in math on calculating a nutrition label for the dish, in science by growing vegetables and herbs to be used in recipes, and in social studies to create recipes and menus based on seasonal flavors and different cuisines. Cooking Crew is a supply-heavy activity, as the multiple teams competing all should have their own similar set of supplies to use. Each team needs cutting boards, knifes, butane stoves, peelers pots, measuring cups, pans, wooden spoons, blenders, mortar and pestles, etc. You don’t need to get everything new. We’ve contacted friends, colleagues, friends of colleagues, etc with a donation list- it’s amazing how many people are willing to support food education for kids. Just make sure the equipment is to a standard that you would be willing to eat off of. All cooking supplies need to be kept in rodent proof plastic tubs. The way we mark the cooking supplies (and everything else like tubs, aprons, daily plans) is with different color duct tape, which you can get at a home improvement store or amazon. Just put a piece on everything, and use it to hang up the daily plans on the wall. For cleaning, each cooking crew team sets up their own 3-bin system (wash, rinse, sanitize) using restaurant-style dish bins (these are also labeled with duct tape). This way the sink only needs to be used to wash hands, rinse produce, drain water, and wash stock pots, blender tops, and other large items. Soap, bleach, and sponges are also needed for each team. To keep the sponges for the 3-bins dry, use a paint brush holder which you can get at any store that sells paint. Other key supplies for the cooking portion of the project are aprons for every participant, sharpies to decorate the aprons, and pins to attach to the aprons to signify earning points and certificates. Cooking Crew needs at least 2 teams, and a minimum of 4 students should be assigned to each team. A cooking crew team can work well with up to 10 students, although there needs to be either one very experienced or two semi-experienced adults working with a team of 10. 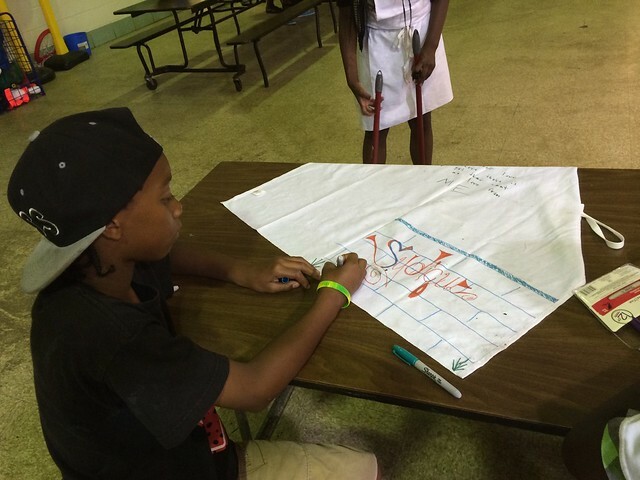 Up to 5 teams can compete at a time, but the space will need to be very large (such as a cafeteria or gym with tables. 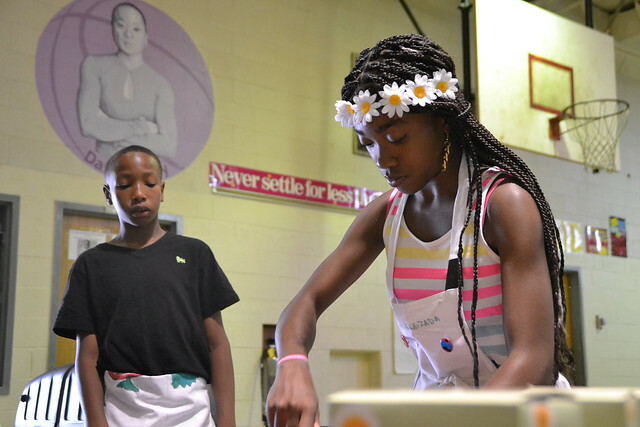 In Cooking Crew young people are empowered to drive each aspect of the food preparation, from creating recipes to delegating roles to chopping, frying, serving, and washing. To facilitate this process, a good deal of supervision from supportive and experience adults is essential. 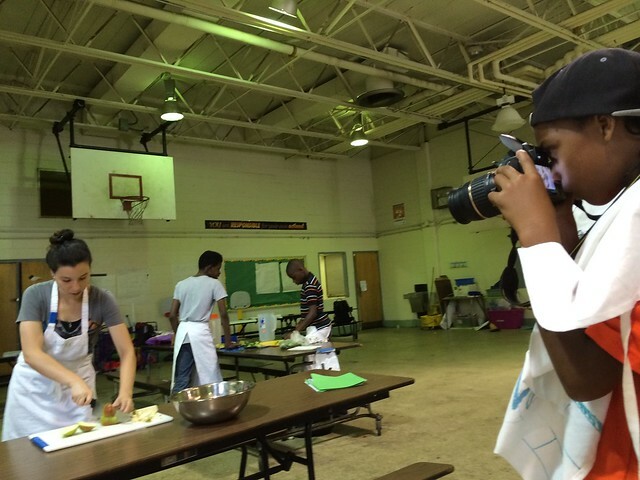 To this end, Cooking Crew provides a meaningful opportunity for adult volunteers (parents, college students, chefs, writers, artists, community partners) to support the overall activity. 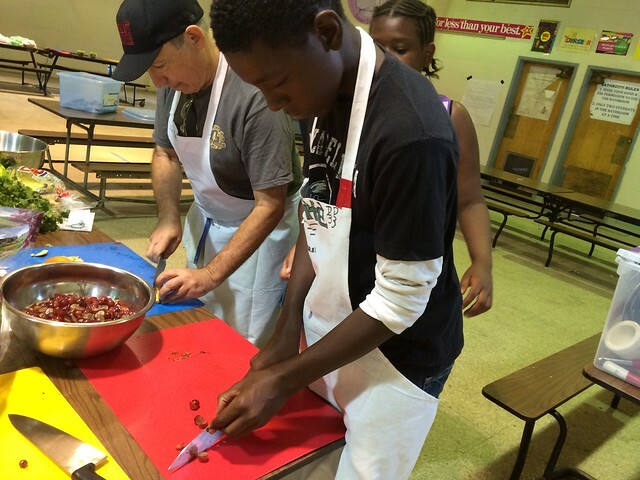 Students bond and build meaningful relationships with their adult mentors, so it’s vital that adults are able to commit consistently to their work with Cooking Crew, and are honest with the students and coordinators if this isn’t possible. Each Cooking Crew team needs at least one adult assigned to it in the role of Kitchen Assistant. The responsibilities of the Kitchen Assistant involve supporting the overall cooking process, with specific emphasis on tasks that include peeling, cutting, and fire. Overall, there should be one adult assigned to the role of Head Chef. This is the perfect job for a high-school student in a culinary program, a culinary school student, or professional chef or experienced home cook. It’s great if the Head Chef has a chef jacket to wear during Cooking Crew as this emphasized their expertise in the culinary area. The responsibility of the Head Chef is to float around the kitchen, moving from team to team to observe cooking techniques, offer support/direction wear needed, and hold students accountable to best cooking practices that were reviewed during the initial Cooking Crew training.